+ 1 mezzanine of 12m2 with sofa bed modular 140. All windows overlook the garden, accessible to all occupants of the residence. 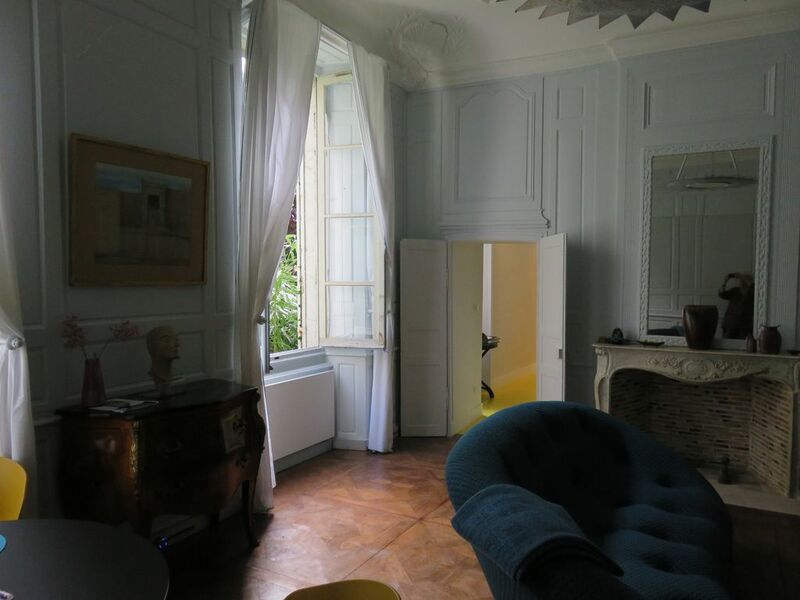 This apartment in addition to its exceptional Rochelais typically, is ideally located close to the old port of La Rochelle, the pedestrian streets, the theater of Coursive, restaurants and best bars and the beach. It's perfect for a family with young kids as everything is a short walk. The apartment is very tasteful and has everything you need, its location is perfect for beaches and restaurants. €500 deposit seems unnecessary, we stay in these type of places all the time and expect a cleaning deposit or €100 breakage deposit, never €500. Beautiful property, with a perfect location for exploring the town. My wife and I, along with our 3 boys thoroughly enjoyed holidaying at this property, it was a privilege to stay in such a unique apartment. Everything was perfect for our stay and the standard of rooms and equipment was exceptional. Equally, it's central location to the old town was a perfect balance for getting in, with just a few minuets on foot, yet being just far enough away for a quiet night's sleep, we loved it and we will certainly be back for another stay. This apartment really has the WOW factor, beautifully designed with quality fittings and furnishings. Perfect quiet location with beach and restaurants 2 minutes walk. Appartement très confortable, très bien équipé, très bien chauffé, très bien décoré et très bien situé. Le lieu a beaucoup de charme. Nous avons été accueillis avec ponctualité et beaucoup de cordialité. Nous étions deux couples d'amis et nous nous sommes trouvés à l'aise dans l'appartement. Situé dans un immeuble ancien, rénové, l'appartement est à deux pas de tout (parc, port, mer, commerces), sans être géné par les bruits de circulation. Il est très bien agencé, le salon est particulièrement agréable et beau. les propriétaires et la personne en charge de la remise des clefs sont à l'écoute et très professionnel et arrangeant. Merci. Pour notre prochain séjour à la Rochelle, nous y retournerons sans l'ombre d'une hésitation. Appartement sur jardin, bien rénové et équipé. The central market is a 10 minute walk through the arcades in the heart of the city.